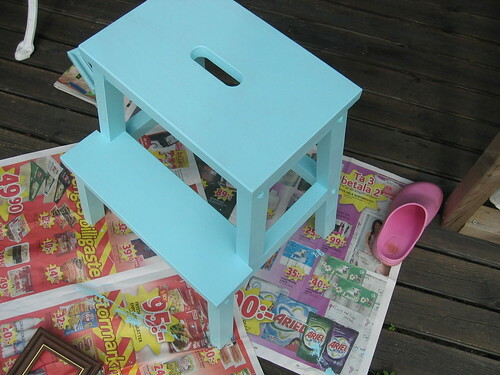 While painting the table I also transformed this IKEA stool that I’ve had for a few years. Its simply made to be transformed and personalized. I always thought I’d do “something” with it, and now was the time. I turned it into a matching turquoise. Isn’t it awesome? I think so. I don’t understand why there isn’t more colour in the things we see in shops; in furniture, clothes and shoes? Don’t get me wrong, I love black polished shoes, but really – all of them? My mom painted her stool dark blue a few years ago, and it was perfect for a kitchen filled with dark blue details, just like hers. Even the coffee machine matched! 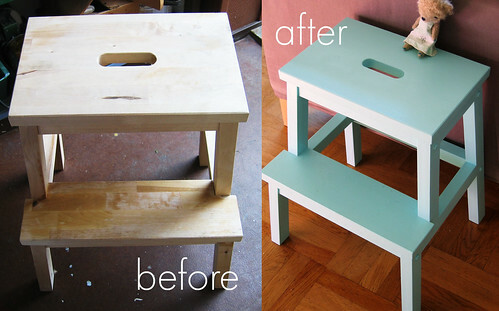 This entry was posted in Home Comforts and tagged before and after, crafty business, personalized, recycling, stool, turquoise. Bookmark the permalink. Wow! Absolutely fantastic looking stool Hanna! That must really cheer you up each and every day, especially if you see the table too. Christmas presents- 98% bought and wrapped! I’m on the ball this year. I’ve just got to get my husbands presents (but now what I’m getting him so is just a matter of ordering) and exchange some sterling for kronor (for my teenage nieces and nephews) and I’ll be all set! Beautiful stool, Hanna! In some of my travels, I actually came across a small store where the lady painted and decoupaged old furniture. The store was so bright and happy! Wished I could have fit a piece in my suitcase. If it’s your dream, I say pursue it! I have a stool just like that from Ikea. I painted mine too. I painted the legs red and left the 2 steps a natural wood color. I love it. I painted my stool red acouple of years ago. It goes along well with my other red details in the kitchen. amazing transformation! 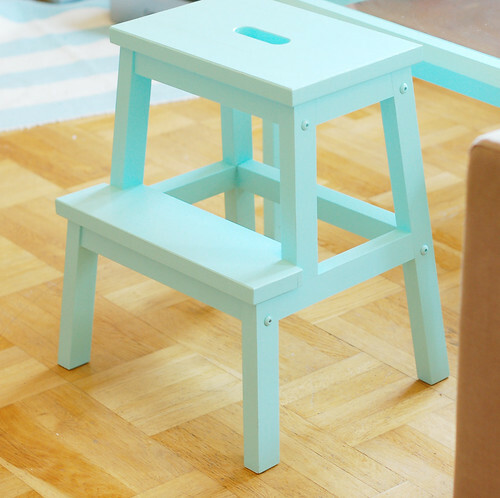 you are right, painting furniture is a hard job — but you made it look effortless! Hi, Hanna. Your new stool color is marvy, and I loved the table, too. I think one reason things are monotone in the stores is because it’s a safer way to sell something. It’s less costly, as you said. But it does make shopping kind of a bore sometimes. It’s great to find lovely things on the web from people who have excellent creativity! If only the website could be translated in english?! i have one of these stools also. i painted mine several colors and stamped a black and white check pattern around edge. fun project. I love that stool! It’s one of my favorite colors. I wish my husband liked painted furniture, because I would fill my house with it, if he did! Kul att din är turkos, det är min med! Men min är en lite mörkare nyans.